CHICAGO, 2017-Jul-18 — /Travel PR News/ — A fun, family lounge has popped-up at Chicago O’Hare International Airport for the summer. The Fly with Butch O’Hare lounge is a gathering place to relax, take selfies, re-charge cell phones and devices, and to learn about the Fly with Butch O’Hare mobile game collaboration with DeVry University. The “Fly with Butch O’Hare” concept helps pay tribute to the airport’s namesake, Edward “Butch” O’Hare. This year marks the 75th anniversary of Butch O’Hare’s historic actions in World War II, saving the aircraft carrier Lexington. He was honored with the Navy’s first Medal of Honor, and in 1949 the Chicagoland airport, Orchard Field was renamed Chicago O’Hare in his honor. The lounge is a high-energy colorful display for passengers to stop and enjoy before heading on to their gates. Chairs with cushions and foot stools are positioned around plentiful cell phone charging stations. The back wall of the lounge is a sea of “O’s” in varying sizes and colors on a field of blue; a playful representation of the “O” in the airport name. The carpet delineates the lounge in light and dark green chevrons and a seating area of bright orange. Overhead, a miniature plane is piloted by Butch O’Hare, who is visible in the cockpit. An eight-foot sculpture of O’Hare’s airport code “ORD” dominates the lounge and is perfect for gathering your traveling party around to snap a photo. Other photo opportunities are available; posing with a nearly-life-size cut-out of Butch O’Hare, and a cut-out wall where passengers take a back seat in Butch’s plane. A flat Butch O’Hare (on a stick) is available for pick up at the lounge, or at sign bins located throughout the domestic terminals. Passengers are encouraged to pose with the flat Butch O’Hare while in the airport or while on their travels throughout the world. 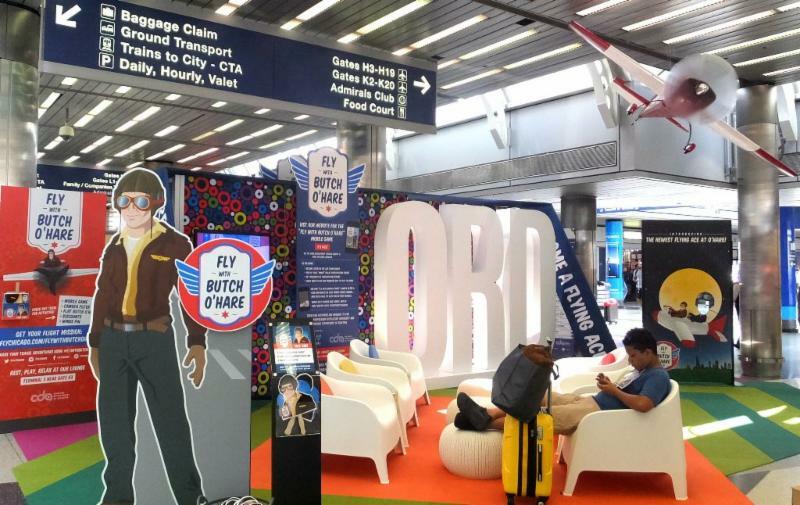 Passengers can then post their photos online with the hashtag:#FlyWithButchOHare for a chance to be featured on O’Hare Facebook page (fly2ohare). Also at the lounge, signs and a video invite passengers to check in often at the website:www.FlyChicago.com/FlywithButchOHare to see the development of a camera filter and The Fly with Butch O’Hare mobile game. Level-one of the free game is scheduled for completion this August. For more information about DeVry University visit www.DeVry.edu. This entry was posted in Airports, Business, Travel, Travel Management, Travel Services, Travelers and tagged Butch O'Hare, Chicago O'Hare International Airport, family lounge. Bookmark the permalink.